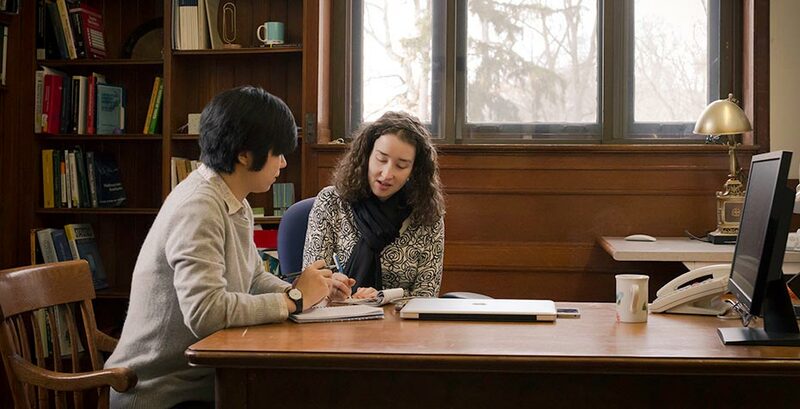 This year, Wellesley saw the opening of an innovative institute on campus, designed to integrate statistics more deeply into the research, teaching, and learning at the College. The Quantitative Analysis Institute, affiliated with Library & Technology Services, provides courses, workshops, lectures, and support in statistical work for both students and faculty. “The QAI provides an exciting opportunity to expand the role of statistics across Wellesley,” said Cassandra Pattanayak, the inaugural Jack and Sandra Polk Guthman '65 Director of the Quantitative Analysis Institute. The institute offers new statistics courses during the summer and the regular academic semesters. Pattanayak began teaching a summer course at Wellesley her first day on campus. This semester, she is teaching an economics seminar on Causal Inference (ECON309), her own statistical specialty. Working with faculty is another important component of the QAI. Alongside the Guthman interns Sophie Sun ’14 (pictured with Pattanayak) and Diana Schron '14, Pattanayak collaborates with professors to develop quantitative exercises designed for applied courses, organize faculty workshops around statistical topics, create opportunities for cross-disciplinary collaboration, and offer statistical consulting for both faculty and student research projects. Learn more about the unique opportunities offered by the Quantitative Analysis Institute.